While I love autumn, I always get wistful for the warm long days of summer. Eating bushels of tomatoes is a one way to hold onto the warmth, but for me summer is about fruit. Pies, jams, sandwiches, pasta, pizza, salad, curry, kimchi all get made with fruit. But, at the end of summer, I also turn to alcohol. That came out wrong...nevermind. I have been making infused vodkas. 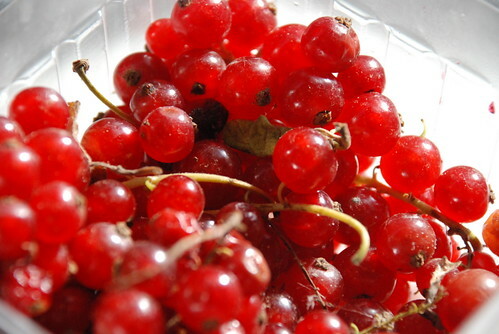 The latest was red currant vodka. I was in an infusing phase a while ago. 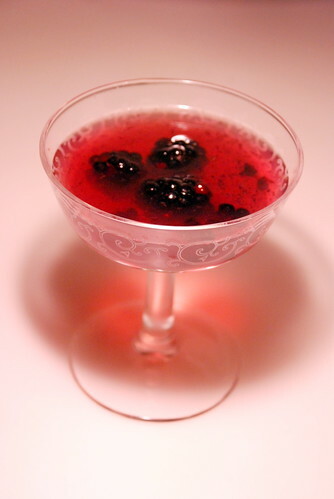 The last of these was red currant vodka which only takes fresh red currants, vodka, and time. The result was only vaguely curranty--so ended up not being the best use of those lovelies, but alas. I used this vodka to make a Blackberry Tammy Collins following White on Rice Couple's Tom Collins as a guide. These were delicious and addictive. And as it is Friday, have a couple with dinner tonight. I might. The colors look amazing ..Too pretty!! Oh... you've just given me an idea! I have been overwhelmed by the abundance of grapes this year. My vines have never put out so much. I suppose it's true what they say; grapes grow best in years where everything else struggles. Grape soda is one of my secret vices; it reminds me of Saturday afternoons at my grandfather's house, Cypress Manor. I expect it may end up tasting like strong kosher wine, but tomorrow I'll infuse some vodka with the Condord grapes and hope for something a little closer to Grape Nehi. Your drink looks really special, perfect to toast the end of summer. I love the coup you served it in too. Can you send me a couple of those please???!! Looks just great! hilltrash: yum! can't wait to read about it. Natashya:thanks. they were my wedding crystal.